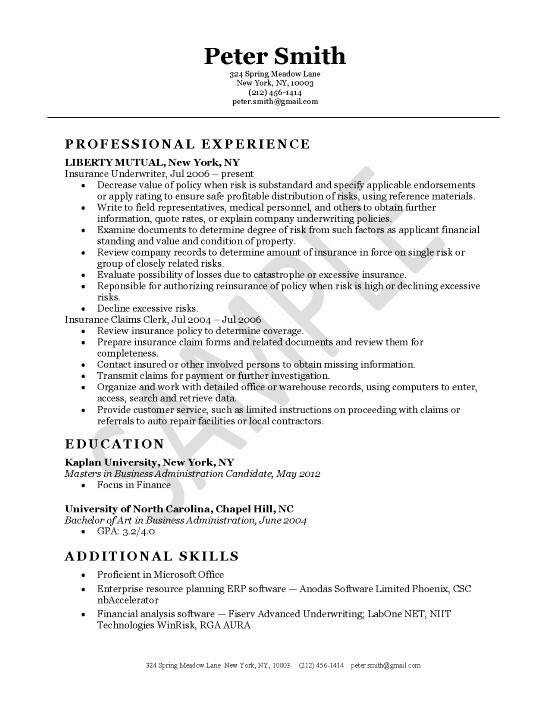 Resume Example for insurance underwriter with job experience at a mutual insurance company. This is a good specific sample for life insurance professionals. The resume does not have an object of summary area. The most recent job is the job target so the summary was removed since the target was specific. This also allowed more room for details in the experience section. The document highlight job experience in underwriting, risk analysis and loss evaluation. The sample notes other experience in insurance policy review, insurance claims processing, documentation and customer service. The education section lists the Bachelor of Art in Business Administration and lets the reader know they are an MBA candidate. Additional skills are used to outline knowledge of software and office products. Gather data and conduct evaluation to determine risk in order to scale rates and approve insurance coverage. Review insurance proposals to determine appropriate levels of insurance coverage. Evaluate customer suitability for insurance coverage while taking consideration of legal ramifications. Apply various underwriting techniques and standards to ensure accurate analysis. Manage insurance marketing activities in specific territories to ensure production levels meet quotas. Utilize propriety risk assessment software to develop exposure levels and ratings while determining premiums. Prepare reports to track underwriting submissions, decisions and recommendations. Develop standards for agents to ensure more candidates meet pre-qualifications and desired conditions.